A while back I visited Acadia National Park with my girlfriend and we chose Somes Sound View Campground as our place to stay. This was actually our first time camping at what would be considered a private campground, as previously we had always camped at State or National parks. I can confidently say that our experience was a positive one and we enjoyed our stay at the campground. It’s located near Somesville on the “quiet side” of Mount Desert Island. This is the side of the island without all the “main” attractions of Acadia National Park and also the side opposite of Bar Harbor. 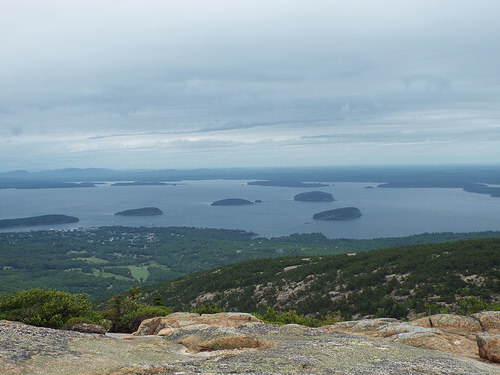 I’m hoping that my review of Somes Sound View can help you in making a decision if you ever decide to visit Acadia National Park (you should). We stayed at site 15 that had a tent platform and an electric outlet which was convenient for charging our phones. All sites at Somes Sound View have a picnic table, fire ring, and their own individual water faucet. Do make sure you bring a dish washing bin, as they don’t allow washing of dishes inside the bathrooms. The site we stayed at was fairly spacious and we did have neighbors fairly close on both sides. We never felt like we were right on top of our neighbors though, and there was enough privacy with trees that it didn’t bother us. I feel like most of the campgrounds in and near Acadia National Park are of similar setup, so if you are looking for dispersed camping you aren’t going to really find it here. There are some walk-in sites at the two National Park campgrounds though. Do you research online first and try to find a campground with sites that aren’t on top of each other! The bathrooms at the campsite were cleaned daily, and I never noticed them being excessively dirty. Sometimes one paper towel dispenser or soap dispenser would be empty, but the other ones always were filled. They also have porta-potties scattered about the campsite in case you didn’t want to walk all the way to the restrooms at that time. They were cleaned three times a week and they were very clean for what they were. The showers were also clean and they were all in individual little “rooms” within the restrooms – all with a small changing area right outside the shower as well. The only downside is that you have to pay $1 for 5 minutes of hot water, but this is standard across the campgrounds on the island. The only campground we found that didn’t charge for hot water was Bass Harbor Campground, but that was also the campsite furthest from the main area of the National Park. The two campgrounds within Acadia do not have showers at all, and you must go right outside the park to use pay showers if you are staying there. The campground also had a small store that sold things like bug spray, soda, water, batteries, and toiletries. They also sold ice and firewood at the camp store as well. We found it was cheaper to buy firewood on the side of the road and ice at the grocery store, but if you weren’t going out the camp store was only $1 more for each item. Everyone we spoke to that worked in the store was extremely friendly and helpful, and the same thing when I made my reservation over the phone and confirmed it through e-mail. You are also able to rent kayaks, canoes, and paddle boats though we did not personally take advantage of that. There was also a heated in ground pool if you wanted to go for a swim (much warmer than the ocean in Maine). To get around, we mostly took advantage of the free bus service that is offered throughout the island and Acadia National Park. We drove and parked at some of the less popular trailheads, but if you are trying to visit any of the main attractions along the Park Loop Road, the bus is the way to go. Everything gets extremely crowded and it wasn’t worth the hassle of fighting the traffic for a parking spot. The only disadvantage of Somes Sound View Campground is that it is not a direct bus stop like some of the other campgrounds in the area. We would park at nearby bus stops or at the Visitor Center, and then take the bus from there. It wasn’t a big deal for us as it was usually only a 5-10 minute drive at first, but if you are looking to keep your car parked for the time you are there, you might want to look into other campgrounds. Acadia National Park itself was amazing, and I wish that we had longer than just a week to visit. There was so much to see and do, and I feel like we really only saw half of the park. We probably hiked almost 30 miles in a week, and there were still trails and things that we wanted to do. There really wasn’t any boring moments other than during one day where it mostly rained, and we still drove around the Park Loop Road and took some pictures. If you have a chance to get up to Acadia National Park, I highly recommend checking it out. I hope that my Somes Sound View Campground review also helps you out on picking out where you want to set up your base camp. I know if I went back to Acadia, I wouldn’t hesitate to book another site at the campground. If you have any more specific questions about Acadia National Park or Somes Sound View Campground, feel free to ask them below in the comments. I may have missed some details and can do my best to answer your questions to help you out!